I was wondering about the differences between comment, suggestion, and feedback. They often seem to be used interchangeably. I would like to know how to use each word appropriately in different contexts. comment noun: a remark or criticism on or upon anything. suggestion noun: an idea or thought suggested, a proposal. feedback noun: information about the result of a process, experiment, etc. The word comment has the broadest application because a comment can contain a suggestion or provide feedback. The comments that follow the posts on this site provide examples of all three terms. Carnival – The word derives from a phrase meaning “the putting away of flesh”… as in the fasting from meat as Christians [according to traditional dogma] are supposed to do during Lent. It became an event of feasting and revelry because it’s the last chance for the next 6 weeks to indulge in that delicious pot roast, steak dinner, or other self-gratifications. The reader has added information relating to a post about words derived from a Latin word meaning flesh. This kind of comment enriches the site by expanding the post in a relevant manner. Could you also clarify and explain the origins of “chalk it up”. I’ve also seen “chock it up” which I assume is an error. I’ve also heard “chop it up” in the same context. This reader, in commenting on the post about chock-full, has made a suggestion for a future post. Such suggestions keep me supplied with topics. Feedback can be positive or negative. Comments that express agreement or appreciation let writers know they’re on the right track with their intended audience. 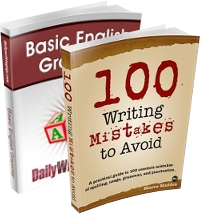 Comments that point out errors or ambiguity enable the writer to improve a published post. NOTE: I like to receive feedback that points out typographical errors by way of email, rather than in the open comments section—and not just to minimize my embarrassment. When the error has been corrected in the post, the comment remains as a distraction to future readers. feedback noun: The return of a fraction of the output signal from one stage of a circuit, amplifier, etc., to the input of the same or a preceding stage, “positive feedback” tending to increase the amplification; “negative feedback” tending to decrease the amplification. Also, a signal so returned. I’ll take this opportunity to thank my readers for all three—comments, suggestions, and feedback. 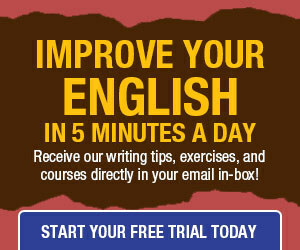 They are and have been of tremendous benefit to me, as a blogger and as a student of English. Actually, the spelling of the word “cockeyeed” gives me story ideas. The English major part of me is disturbed by the spelling. My writing side asks, “What kind of character, besides a pirate perhaps, would actually say “cockeyeed.” I’d hate to write about a pirate. Jim, check out the play/movie”South Pacific,” one of my favorite musicals. The song “Cockeyed Optimist,” but not necessarily my favorite song from this play, is sung by Nellie, a Navy nurse and the female protagonist.